Home » »Unlabelled » Why Durian Plus Cola Is A Deadly Combination To Eat And Drink? Why Durian Plus Cola Is A Deadly Combination To Eat And Drink? 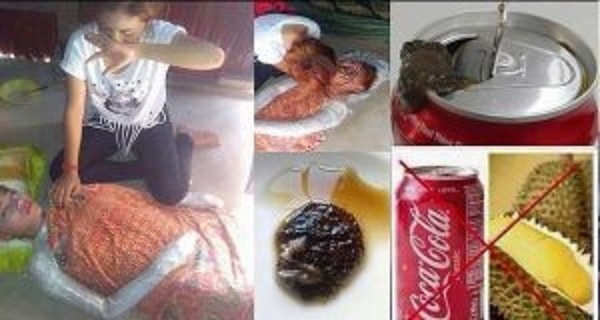 A foreigner died in Thailand after eating a lot of durian and drank Coke. Learn why this fruit is deadly when combined with a cola. There have been various reports regarding the fruit Durian can be deadly when consumed with cola, alcohol, coffee or milk. A man named Kim-Siang Ng reported that a 28-year-old Chinese tourist visiting Thailand died because of excessive intake of Durian then drank a Coke in-can. He labeled this combination as “cobra poison” and warned people to not drink cola right after eating durian. He also said that Thailand also released a warning to not drink cola or anything with high caffeine content within 8 hours if you eat durian fruit. According to the source, Chinese guy suffered from caffeine intoxication caused by the surge in blood pressure that led to his sudden cardiac death. One study conducted in the University of Tsukuba by John Maninang and Hiroshi Gemma showed that this deadly combination is possible. Durian fruit has a high sulphur content that impairs alcohol breakdown that can shutdown the activity of an enzyme that helps to clear toxic products in the body (aldehyde dehydrogenase) by up to 70%. By that study, it tells that toxic materials failed to be cleaned due to the enzyme to not work properly due to the high sulphur content of durian.